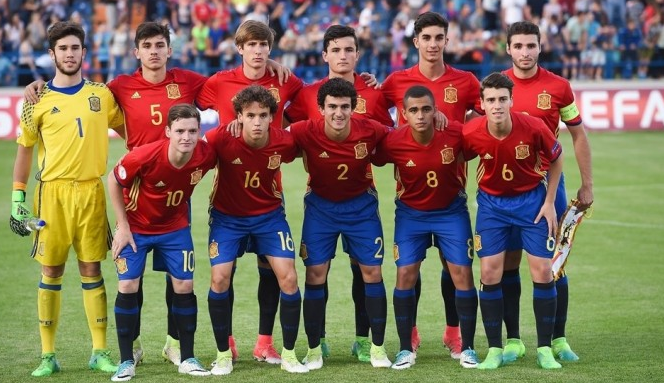 Spain National football Under 17 team is the national under -17 football team that is participated in the upcoming event FIFA U17 World Cup 2017 that will be kicked off on 6th October 2017 to 28th October 2017. The team Spain is controlled by Royal Spanish Football Federation (Real Federacion Espanola de Futbol – RFEF), the governing body for football in Spain. Spain has qualified 8 times in FIFA U17 World Cup where they reached at Runners up level thrice in 1991, 2003 and 2007. They also have qualified 6 times in European Championship in which they won the champions trophy thrice in 2007, 2008 and currently in 2017. The team Spain is well known by their fans as “La Rojita” (The Little Red One) and “La Furia Roja” (The Red Fury). Santiago Denia is currently the head coach of Spain under -17 football team.